She was born in New Jersey, but lived in Honolulu, Hawaii with her husband R uss, for almost 50 years before becoming a Timber Ridge resident. Throughout her running career (she started at age 35), she's competed in 42 marathons, all across Hawaii. Although she says she's run her last full marathon, she continues to run races and has a group of friends with whom she runs the Hawaii Pacific Health’s Women’s 10k every year. She has also picked up races local to Seattle and she plans to complete the Seattle Half Marathon this Thanksgiving weekend. Judy loves running because it brings people together and creates a sense of community. I used to meet with a running a group and it was nice because there was no age discrimination; you just show up and run, nobody cared how old you were. She told us that despite all of her long distance running, she's never seriously trained; she's in it for the enjoyment. 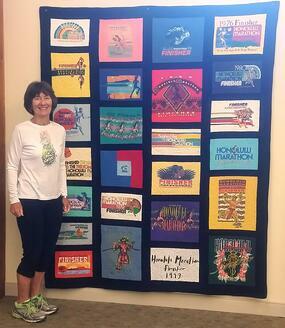 You can see Judy pictured next to a quilt she made from some of the t-shirts she received during marathons she's completed. Shortly after Dan graduated from MIT, he married the love of his life, Portia, and they moved to Southern California where he began taking classes at USC and started work at the Hughes Research Laboratory. He's had quite a career - not only did he play a large role in the development of the modern day laser, he later went on to serve as the Chief Patent Counselor at Boeing. Now, at the age of 89, Dan resides with his wife Timber Ridge. When Dan wasn't in school, developing lasers, or working through patent law, he was running. He finished his first marathon, the Palos Verdes Marathon, at the age of 24, and he went on to run marathons in Boston, Tri Cities, Culver City, Northern California’s “Avenue of the Giants” (his favorite), Vancouver, Memphis, Austin, Los Angeles, Athens, among others. In his earlier years, Dan enjoyed training others using his 6x6 training method that helped his trainees go from walking to running a 10k at the end of six months. He trained his colleagues from Boeing, including the President of Boeing at the time. All told, he completed 116 marathons. 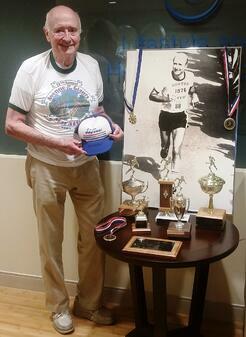 He ran his last marathon at 80 years old, but he's not done running; he's led and participates in the running group at Timber Ridge. I talked with a lot of folks at the 2017 LeadingAge Expo last week about how they can make the most out of their senior living community fitness center. In case you and I didn't connect at that event, here are 3 tips on how to make the most out of your community fitness center programs. Upgrading what you're offering in your fitness program is a great way to stand out from the competition (if you do it well), but offering a trainer a few hours per week likely isn't enough to truly draw residents into the fitness program. If you have no staff - start there. Let's talk about how you can start providing expert staff in a cost effective manner with the greatest impact for your community. If you have staff - evaluate how effective they are for your residents. There's a nuance here that's worth mentioning: how well-liked the staff are is not the same thing as how effective they are. 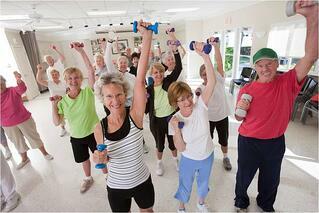 Your residents deserve both an affable fitness team and effective, fun, engaging programs and services. So when you're thinking about how well your fitness staff are performing, start by addressing how well-received they are, but don't stop there. Ask how they spend their time in service to the residents and how are they measuring the success of the community fitness program. For example, are they providing services, like exercise prescriptions, equipment orientations, and assessments that help residents understand how to exercise safely while working positively toward their goals? Do you have data on how those services are used? As a leader in the community, you should be getting data about how effective the programming is, how many residents are participating, and what the fitness staff will do differently next time to achieve their goals. If you aren't getting that kind of information from your program, it might be time to look at ways you can improve your program. I talked with a number of community leaders who noted that they have fantastic staff in their fitness center and were thus certain that we wouldn't have services that would benefit their community. The truth is, there are always ways to do better; what we're really talking about here is whether there's an appetite to pursue improvement. If you don't want to turnover staff, but you recognize your fitness team is only as good as the silo they're in, consider bringing in a consultant to evaluate the programming. There are most likely areas where your program could improve. Bringing in a consultant with an extensive background in the field and blissful ignorance about your services is a great way to uncover those opportunities that aren't apparent to those who are working in that environment. Do you know how many classes you offered last month and which residents attended compared to the preceding month? Do you know how many appointments were conducted in the fitness center last year compared to this year? Does your tracking for fitness center or class attendance allow you to see individual participation trends by resident? In many communities with which we work, there is often some type of sign in practice in place, but typically little to nothing is done with that information once the resident signs his name on the way into the fitness center. Consistent participation tracking is even less common in the group fitness classes; it's more common to simply estimate headcounts. Tracking resident participation in all of your offerings is central to highlighting the value of your fitness program and continuing to evolve what you are doing. Read on to discover three key ways participation data can help you provide more effective programming in your senior living community fitness center. By keeping record of how many total visits you have to your fitness center, pool, and group fitness offerings, you can determine the ebbs and flows in participation through the year. As the busy holiday season approaches and exercise routines get pushed to the back burner, set a community goal for your residents to accumulate more visits in December of this year as opposed to last year. We’ve seen firsthand how residents LOVE to rally together as a team for goals like this. Providing them with weekly updates on their standings has helped us reach visit goals and prevented lulls in participation. You won’t know what a reasonable goal is, however, if you don’t have historical data to evaluate. Your tracking system should allow you to see how many times any given resident participates in part(s) of the program. If someone comes to a particular exercise class six times a month and the fitness center nine times a month, you should have that information at your fingertips through proper tracking procedures. Then you can recognize their efforts through recognition programs such as a monthly “Fit 15” listing. Similarly, if you have a resident who joined the program but stopped coming, you’ll have that important information at your fingertips. Personally contacting a resident and letting them know that their participation is missed and inviting them back to an old favorite or a fresh new opportunity can be a great tool for improving exercise adherence. Let's be clear: We’re talking about tracking attendance by resident; that’s the only way this will work. Taking simple headcounts for total visits in your program will not allow you to consistently evaluate the specific members who make up your participation and create those avenues for personal connection and recognition. Having participation data that shows you monthly totals for your different offerings will allow you to evaluate what is effective, what is gaining or losing momentum, and what might be ready for a change. By sticking with a group fitness class on the calendar that has only two or three consistent participants, you might be limiting resources that could go toward a fresh new offering that would cater to the needs and interests of more individuals. Residents will be much more able to embrace change when you can show them the data and well-thought-out intentions behind it. Similarly, if you feel your program cannot expand further without additional resources, let the data demonstrate the value in your current offerings. If an exercise class is busting at the seams, have a few months worth of data to show the growth and articulate the need for another class on the schedule. If your fitness center participation is increasing, use the monthly visit and appointment data to demonstrate the need for additional staffing support or more equipment. Don’t shy away from data. It can support important decisions about the future of your fitness program. Start small with a simple list of all the residents in the community and invite them to start checking in. From there, you can build basic spreadsheets to create a tracking tool that will help you determine what parts of your community’s fitness program need the most attention. 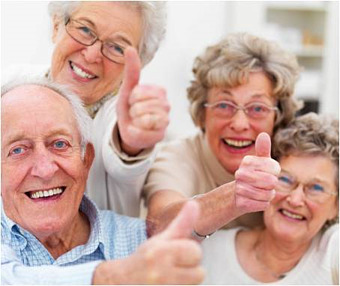 Or, reach out to us for NIFS consulting services - we'll provide you with the tools to get off the ground quickly with improvements to your fitness program that boost your senior living community. Raise your hand if you love hearing stories about how your staff make a resident’s day, particularly when it occurs organically, if you will, by the employee simply being who she is. I know…me too. That’s why I couldn’t resist sharing these two stories in our blog and how we engage residents in senior living fitness programs. Our organizational structure is such that we hire exceptionally capable, qualified, and passionate staff who we train well. When they’re ready, we set them off at their client location to do their work. Certainly, we provide a host of supports, ongoing training, and other touch points, but it’s tough for me to keep track of their day to day challenges and victories when they are far flung in 22 states with more than 60 clients. So when these two stories got back to me, I simply had to give this shout out! When we first start working with a new senior living client and we place one of our fitness center managers onsite at the community, we sometimes get pushback from a small group of vocal residents about the information we require of them prior to helping them with an exercise program. Industry standards through the American College of Sports Medicine establish that sound practice involves gathering relevant health information, securing a signed waiver, and getting a medical release where appropriate. If we get push back from residents, it’s typically with the waiver and a common objection to the industry standard language we use. This story comes from that exact circumstance where a small group of residents had protested our use of a release for the fitness program. While we were in discussion with leadership at the community about NIFS practices, and how the community wanted to proceed, our manager, Ali, continued to do what she does. She worked with the early adopters providing senior fitness testing, individualized exercise programs and guidance, and continued to follow up with those participants about their progress and any questions they have. She offered creative group exercise classes and continued to enroll residents in those programs. She focused in on improving resident’s balance through both class and 1:1 settings, and she continued to help participants track their progress as their strength and balance improved. Meanwhile, the residents did what residents do. They talked to their friends and neighbors. Those who were engaged in the new fitness programming with the NIFS fitness center manager talked about how much better they felt, how they could tell their balance was improving, and how easy the manager was to work with. And then those initial naysayers started thinking that they might be missing out on something really positive going on in the community. So, within a few weeks of raising strong objections to our paperwork, those most vocal opponents put aside their concerns, completed the paperwork, and started receiving the same positive health benefits that their friends and neighbors had been experiencing. We’re grateful for the opportunity to serve more residents in the community, and I’m completely tickled that it all came about simply because the NIFS manager kept doing what she’s amazing at with those who were ready. The second story is one of those “well, duh” moments. The action our staff member took in response to a resident need is truly a no-brainer. But I say that and I know that I may not have arrived at that simple action which has definitely resulted in improved quality of life for that individual. Rachel made this resident’s day simply by being who she is – a creative problem solver who is passionate about helping the residents enjoy very active living. When Rachel learned that one of their formerly regular participants stopped exercising, she wanted to get to the bottom of it. Turns out, the resident was unable to use the check in scanner because of a low vision condition, so she simply stopped attending group exercise classes. After Rachel learned about the barrier, she worked with the resident to place a small piece of adhesive felt to the membership tag and taught the resident how to orient the felt in front of the scanner for a successful check in. That resident was able to feel her way to a successful fitness center check in and removing that barrier was enough to pull her back into group exercise classes twice each (and every) week. As a fitness staffing agency, we are fully committed to hiring and holding onto exceptional staff who are not only knowledgeable but also passionate about the audience they serve. Click the button below to read more about how we do that, and then contact us to learn how we can work together to boost your community's fitness program.